Spice up your Moscow Mule by making one of its essential ingredients—ginger beer—from scratch. Spice up your Moscow Mule by making one of its essential ingredients—ginger beer—from scratch. With this kit, you can ferment up one gallon of piquant ginger beer from all-organic ingredients in about a week's time. It comes packaged in an embroidered mesh bag for easy brewing, and while the standard soda is non-alcoholic, you can also make a spiked version: The brew's final ABV ranges from 0 -10% depending on your desired flavor profile. Once your mixer is ready, whip up a round of cocktails (the kit makes enough for 32) and pour into the antique-finished copper mugs with brass handles. The natural interiors will age with each use, giving the mugs a unique vintage quality with time. The kit is also available straight up—without the mugs. Either way, the set of included coasters double as a rousing drinking game. Assembled by Ryan & Melanie Belshee in Nevada. As an Eagle Scout, Ryan Belshee has always enjoyed creating things by hand. Ryan has a thirst for knowledge and loves a good experiment. On a whim Ryan decided to try his hand at making a batch of Absinthe at home. Unfortunately, private distilling is illegal in Oregon and it can be dangerous. With a little research he decided to give infusion a try. Through some trial and error the Absinthe infusion spice blend was born. Following the successful discovery, Ryan put his BA from Portland State University's Business school to good use and turned his delicious experiment into a company. When he's not busy grinding and blending spices, Ryan keeps his wife Melanie on her toes coming up with the new flavor profiles and a wide range of other crazy ideas. The pair met in high school and celebrated 15 years of marriage this year. Melanie Belshee dreamed of being an artist from a very young age. Her passion for art carried grew into a career after earning her Bachelors of Science in Graphic design from the Art Institute of Portland in 2001. Originally wanting to work as a children's book illustrator, Melanie fell in love with Graphic Design and has been practicing her craft for the last 15 years helping large businesses and small non-profits create and maintain their branding image. Now as a small business owner and manufacturer, Melanie is thrilled to be able to share her work on a product line that is close to her heart. Always a fan of vintage, historical works; creating the look and feel for her very own product line has been a dream come true. Melanie aspires to keep every package design as historically accurate as possible along the way spending hours researching in an effort to keep the style true to the prohibition era period. Without Mugs Kit includes everything above except the two copper mule mugs. Sugar and Spices Refill includes a full refill of organic cane sugar, ginger root, lemon peel, coriander, and lime peel. Capable of making alcoholic or non-alcoholic ginger beer with an ABV range of 0-10%. Hy husband has recently discovered the making of Mules. So this ginger beer kit is the perfect gift for the purveyor of the perfect Mule. I bought the whole kit for my boyfriend last Christmas and he requested it again this year! This was a gift for my husband. I was worried it would not be what he was looking for but it was a great starter kit! 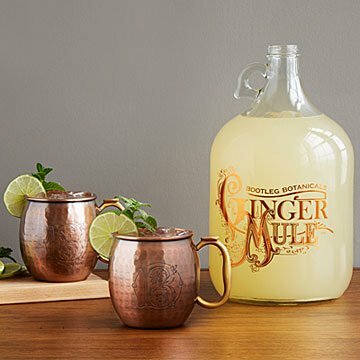 My husband and I love Moscow mules so when i stumbled across this I thought it would be a perfect little extra gift for Christmas that we could do together. The instructions were alright but overall the task is not simple for first timers. We were pretty strict in following directions and sterilizing EVERYTHING we used and touched and worked with. Well it was basically a waste of time because after the recommended time of fermentation is had black mold on the top and obviously was not consumable. Again, not sure if this was user error or not, but even if it was the instructions should have been clearer and easier to follow. Bought this for my husband for his January birthday, finally got around to attempting to do it a few weeks ago (our bad, but new baby blah blah) and while conceptually its a great gift, it is way too much work for it to be fun for us. Had I known all the steps and risks involved I would not have purchased. So, just a heads up, if the recipient doesnt want to WORK for his/her homemade ginger beer, maybe pass on this one. Santa may bring this for me, too. What describes the perfect gift? Part science experiment, part culinary experience, something to be enjoyed over and over again? And what you create is a tasty beverage, that can be enjoyed by the whole family - kids can drink it plain while the adults can mix it however they like. I bought this for a my BIL's birthday - their friends are envious and he is on duty to brew up some extras (kept conveniently in his growlers) for Christmas. Highly recommended. Next time I will make my own kit. Bought this kit for my 12 yr old son who loves ginger beer. We would have liked clearer, easier to find instructions for the non-alcoholic version. Expensive after looking more closely at items in the kit. The product is a Christmas gift but it is really beautiful. The kit comes with everything needed to make the beer. The beer is easy to make. Also the taste is great. This makes a great gift for anyone who's never tried to brew beer before as it's very easy.